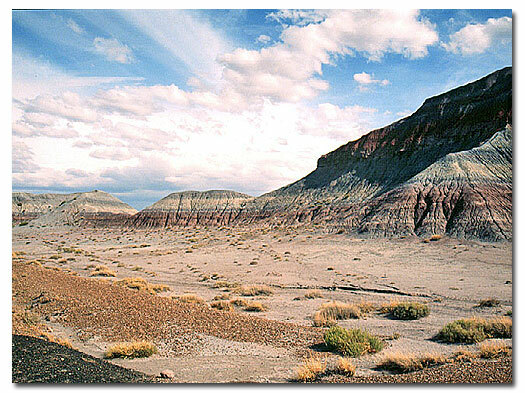 The 27-mile Scenic Drive through the Petrified Forest National Park has numerous pullouts. Eight overlooks along the rim offer sweeping views over portions of the Painted Desert and other points of interest within the park. The Painted Desert Inn Museum at Kachina Point was built in the 1920s and was- rebuilt by Civilian Conservation Corp in the late 1930s. In 1987, it was designated as a National Historic Landmark. Access to the Painted Desert Wilderness is behind the inn; wilderness camping begins beyond the washes. Chinde Point picnic area has water and restrooms in warmer months. The park road winds through 6 miles of high desert and crosses over Interstate 40, the Santa Fe Railroad tracks, and the Puerco River to arrive at the Puerco Indian Ruins. A few rooms are excavated and partially restored. (Restrooms and water in warmer months.) An overlook offers views of Newspaper Rock, a huge sandstone block covered with petroglyphs. The Tepees are badland erosional formations colored by iron, manganese, and other minerals. A 3-mile spur road climbs Blue Mesa, where pedestal logs abound. The hard logs act as capstones to soft clays beneath. Eventually, the pedestal erodes, the log falls, and the cycle begins anew. The Jasper Forest Overlook shows the area's topography, with petrified logs strewn below. Logs with root systems show that some of the trees grew nearby. Fossil destruction in the Crystal Forest area by souvenir hunters and gem collectors prompted Arizona Territory citizens to petition Congress to preserve the petrified wood sites. Cracks and hollows in logs here once held beautiful clear quartz and amethyst crystals. The Flattops are massive remnants of a once continuous layer of sandstone capping parts of this area. The remaining cap stone protects layered deposits long eroded from other parts of the park. Flattops wilderness campers park here. Camping limits begin 0.5 miles from the road. The Long Logs and Agate House trails explore part of Rainbow Forest. Iron, manganese, carbon, and other minerals lend bright colors to the petrified wood. Agate House is a partially restored pueblo. The trail through Giant Logs behind the Rainbow Forest Museum follows up and down the slopes. The fence serves as a constant reminder that the petrified wood and all natural and historic objects in the park are preserved and protected by law. From the Rainbow Forest Museum, the park road continues 2 miles south to the park boundary and highway 180. Agate House: 0.9-mile paved round trip leads through petrified wood and ends at a reconstructed Anasazi Indian Pueblo. The 8-room pueblo sits on a knoll, 50 feet above the surrounding area. The walls are built entirely of petrified wood sealed with adobe. Archeologists say the pueblo was only occupied for a short period between 1100 and 1300 AD. Blue Mesa: 1.0-mile steep, paved loop leads from the top of the mesa down into the blue badlands, a colorful area of cone-shaped hills in Chinle Shale. The hills are composed of bentonite, a soft, porous clay, which is very susceptible to erosion. The bands of color represent different layers that were deposited under water. Manganese and iron oxides are responsible for the colors. Crystal Forest: 0.8-mile loop. The trees of Crystal Forest once covered quartz and purple amethyst crystals which developed in the hollows of the logs as the trees petrified. In the late 1800s, before the establishment of Petrified Forest National Monument, many of these logs were dynamited by those seeking these semi-precious gems. Massive petrified trees were blasted to the small chips you can still see scattered about. Giant Logs: 0.4 mile paved loop past some of the park's biggest petrified logs. The largest log, "Old Faithful" measures over 9 feet at the base. Long Logs: 6.0-mile paved loop leads through the largest concentration of petrified wood in the Park. The logs here lie criss-crossed atop of each other in log-jam fashion. Most are the petrified remains of extinct conifers. At the north end of the loop are some of the Park's longest intact logs, one of which measures 116 feet. Painted Desert Rim Trail: Easy, unpaved 1.2-mile round trip winds along the Painted Desert rim between Tawa and Kachina Points. Puerco Indian Ruins & Petroglyphs: 0.5-mile paved loop leads from the parking lot to ruins and petroglyphs near the Puerco River, where the Anasazi built a 76-room pueblo. Sections of the pueblo and a kiva have been partially excavated and restored. The park backcountry includes 50,260 acres of established wilderness in two units -- Painted Desert and Rainbow Forest. Day hikes are a good way to explore the backcountry. Many features can be reached in a one-day trip, most lying within a few miles of the park road. There are not many developed trails in Petrified Forest National Park itself. 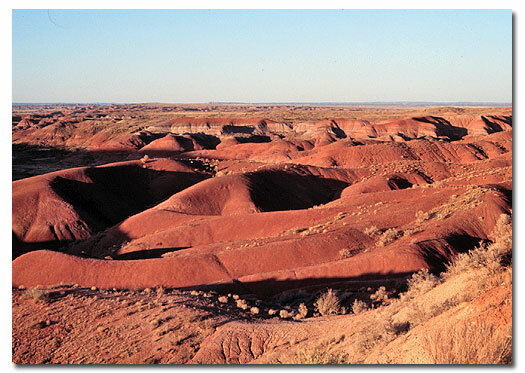 The Rainbow Forest Wilderness consists of 7,240 acres of grassland and scattered badlands formations. 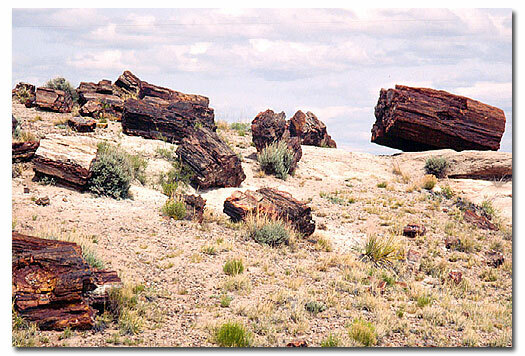 There are several areas of petrified wood deposits within the wilderness. The trailhead and parking area is at the Flattops pullout. You must hike one mile from the trailhead into the wilderness area before setting up camp. The Painted Desert Wilderness consists of 43,020 acres of colorful mesas, buttes and badlands with scattered areas of grassland. Prominent features include the Black Forest (petrified wood deposits), Chinde Mesa and Pilot Rock. Parking for the trailhead is at Painted Desert Inn parking area, located at Kachina Point.